Have you ever caught yourself hurrying when you don't even know where you're going? Do you ever find yourself stressed out when there's no reason to be? We live in a hectic society. Our minds have been conditioned to be stressed all the time. We are told to relax, but there's a problem: We don't know how. You probably don't have time to learn yoga or meditation. You probably don't even have time to take a few weeks off, and if you do, all you can do is think about work. It's a vicious cycle that never seems to end. Even though I've never worked a real job in my life, I've found myself stressed and burned out several times. There's a simple, universal secret to being at peace and eliminating stress, fear, and anxiety. It's so simple that you've probably heard about it thousands of times, but dismissed it. There's nothing you have to do to be at peace. At our core we are joyful. Look at children. When they are born, they're happy, but once they start learning how we "should" behave, they pick up habits and become increasingly unhappy. There's nothing you have to strive for. When you peel away the layers you've accumulated through the years, you'll notice yourself smiling more and enjoying the little things. Sure, your ego will object and say, "Hey, there are lots of things I have to strive for. I need this, that and the other thing." But when you really look at it, you see that happiness and peace is not external, it's internal. Marketers and advertisers know how to push your buttons. They constantly have you feeling like you haven't got enough, that you aren't enough. It's a science, and they've figured it out. Realize that you do not have to listen to everything your mind says. You are not your thoughts. You are the observer. Imagine waking up with a smile on your face and not a worry in the world. Sure, you may have things you have to do, but you no longer obsessively think about them. If you make what I am about to tell you a habit, this is not only possible, but probable. You have to be consistent, because if you are, you will see results, just like I have. What I'm talking about is gratitude. Being grateful for what you have not only melts away fear, it also alters the way your brain functions. It's easy to get caught up in the daily drama of life, but when you think about it, you have a lot to be grateful for. I know you may have your problems. We all do. It doesn't matter how successful you are, you will always have problems in your life, so why not be happy right now? We're used to focusing on the negative, and that has to end if you want to be at peace. I'm not telling you to ignore your problems. I'm saying that dwelling on them gets you nowhere. 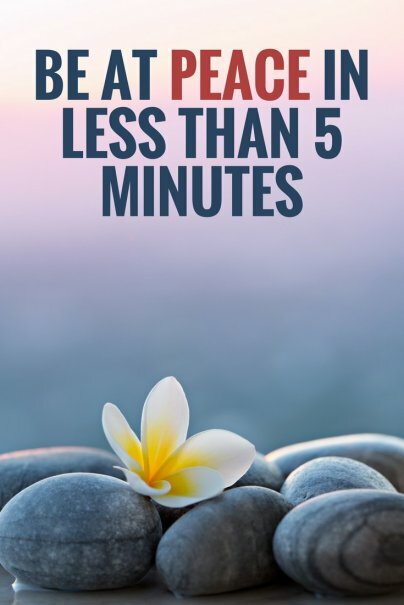 So how exactly can you be at peace in less than five minutes? Contrary to what you may believe, you can be grateful for pretty much anything. You can even be grateful for the negative things in your life, because the mere act of saying thank you will fill your heart with positivity. Sit down in a quiet place, close your eyes, and take 10 slow, deep breaths. Feel yourself becoming increasingly relaxed and begin thinking about what brings you joy. It may be your health, your family, your friends, or just thinking about the fact that you have a roof over your head and food on your table. We take the simplest things for granted. This is an exercise where you remind yourself that things aren't as bad as they seem. In order to stay consistent with this, you will have to establish some kind of routine. You could keep a special gratitude journal by your bed. Begin by writing down one thing you're grateful for tonight. Tomorrow you can write down two things, and keep going. In the beginning, this may be hard, but if you keep doing it, you will be overwhelmed by the amount of things you can be grateful for. Now it's up to you to take the ball and run with it. This really works. It has been scientifically proven. You have the control to be happier. It may not be easy in the beginning, but look at your options. Do you really want to be stressed out for the rest of your life, or do you want to be at peace? know God know peace...no God no peace. Thanks a lot for the post. There are a lot of good points here, and I'd like to offer my take if I might. I think a distinction needs to be made between being positive and being at peace. Technically, developing focus, the ability to quell the constantly running thoughts in one's brain is different from being positive. At least in standard meditation philosophy, focus is particularly about not judging the moment as it passes, in fact not having any opinion of the moment at all. Meditation is that art of cultivating that focus. Positivity on the other hand (and with it gratitude) is a very concrete stance regarding the moment, it imposes a judgment on the moment. Some Buddhists might argue that this is no better than judging the moment negatively, as you become just as invested in the moment and therefore open yourself up to it being a stressor. Now, granted, I'm not saying I necessarily follow this thought process or agree with it, but I think that in speaking of focus and "being at peace" in these terms it's important to be clear on definitions. It's a very important skill to hone, to calm the constant barrage of thoughts and opinions that flow through our minds on a daily basis, and it can certainly lead to more positivity and gratitude, but the process of developing focus should be separated from those things. I've dabbled in meditation from time to time and would like to make it a consistent practice, but one reason it has not yet happened is that I have come to realize it's not a gimmick, something you can be a dilettante in, but rather something that you need to learn to cultivate in every moment, all the time. I think this is a good post especially for people who focus too much on their troubles or on things they want and don't have. An advantage to living in NYC is the proximity to the extreme opposites that exist here. Yes, I see the wealthy every day, but I also see homeless people, some dressed in rags and people begging on the streets. So I am constantly reminded of how fortunate I am to have all that I have. Gratitude is definitely a key to finding peace. Thanks for the reminder! The interaction helps keep you motivated. I love to be grateful! Thank YOU! That is the easiest cop out ever,being religious isn't being happy it's a easy way out of having to think for yourself and just follow rules instead of realising and figuring out life for yourself. Don't be a nieve robot,the point of being human is having your own thoughts and feelings not having them shoved down your throat. Where in this article is religion mentioned? Why are you turning this into an argument against any religion? If God, Buddah or Santa Claus brings one peace, so be it. What ever works. People who are constantly berating people's beliefs are what is stealing the peace from this world.